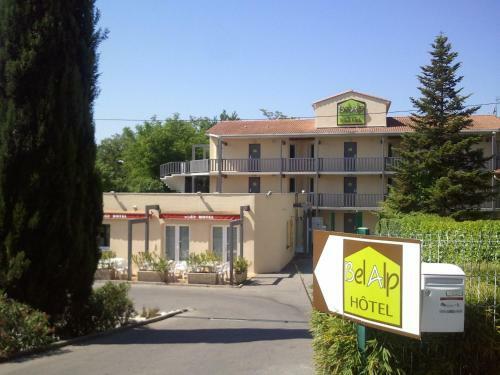 Bel Alp is set in the heart of Manosque, a 10-minute walk from the historic centre and 5 minutes from the railway station. It offers free Wi-Fi internet access. The Bel Alp offers free private parking and comfortable rooms. They feature en suite facilities, a TV and air conditioning. You can enjoy a relaxing moment in the peaceful atmosphere of the hotel's garden. Manosque will charm you with its picturesque little streets, its street markets and calm squares. From the top of the Mont d'Or hill, enjoy the panoramic view of Manosque and its surroundings. Compare travel options from Digne-les-Bains to Marseille Airport (MRS); Bus (2¼ hours) or Lignes Express line 26 bus (2¾ hours) or drive (1½ hours).